Karen Deutsch was born and raised in New York City. She attended classes at The Art Student League at 16 and graduated from Hunter College with a degree in Art with a Minor in Art History. She earned a Masters Degree in Art Education at Penn State and taught at the elementary and secondary levels. She has shown at the Catepetl Gallery in Frederick Maryland, The Samek Gallery at Bucknell, and in numerous Art Alliance of Central Pennsylvania group shows. 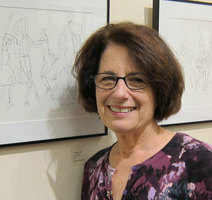 Her pen and ink drawings were exhibited at Schlow Library and "InTown" Cleveland. Her photographs "Flower Fantasies" were on view at the State Theatre in State College, PA and Fraser Gallery. Her still-life paintings have been displayed at the Bellefonte Art Museum where she is on the Artist Registry.